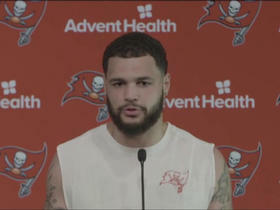 Evans was held out of Wednesday's practice with a knee injury, Carmen Vitali of the Buccaneers' official site reports. 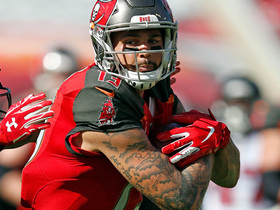 Evans brought in six of 13 targets for 179 yards and a touchdown in the Buccaneers' 37-34 loss to the Bengals on Sunday. 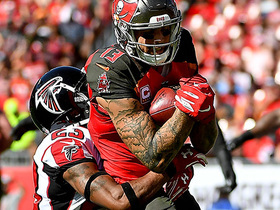 Evans brought in seven of 11 targets for 107 yards in the Buccaneers' 26-23 overtime win over the Browns on Sunday. Evans caught four of five targets for 58 yards during Sunday's 34-29 loss to Atlanta. He fumbled during the game, but it was recovered by the offense. Analysis: Evans is going through a mini-slump over the past two games with 117 total yards and no touchdowns after averaging 122 yards and a touchdown during the season's first three weeks. 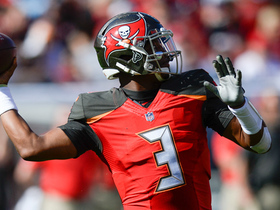 He also saw season lows in catches, targets and yards Sunday, Jameis Winston's first start of the season. If that is a blip or a trend warrants watching, but things might be tough either way Sunday against an often difficult Cleveland defense, especially since Evans might draw emerging cornerback Denzel Ward. Evans brought in six of nine targets for 59 yards in the Buccaneers' 48-10 loss to the Bears on Sunday. Evans caught six of 11 targets for 137 yards and a touchdown in Monday night's 30-27 loss to the Steelers. 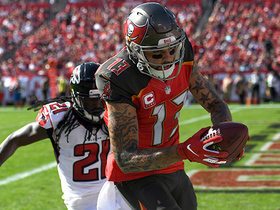 Evans brought in 10 of 12 targets for 83 yards and a touchdown in the Buccaneers' 27-21 win over the Eagles on Sunday. He also lost a fumble. Analysis: Evans' reception total was a team-high figure, as were his 12 targets. The towering target's one blemish was a lost fumble, but he's otherwise gotten his season off to an impressive start. Through two games, Evans has brought in 17 of 19 targets for 230 yards and a pair of scores, with his 89.5 percent catch rate thus far especially encouraging after the 25-year-old's issues with catch efficiency last season. 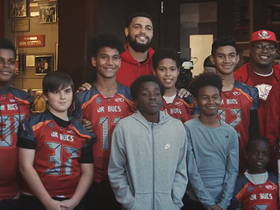 Evans brought in all seven of his targets for 147 yards and a touchdown in the Buccaneers' 48-40 win over the Saints on Sunday. Evans (undisclosed) returned to practice Monday, Greg Auman of The Athletic Tampa Bay reports. 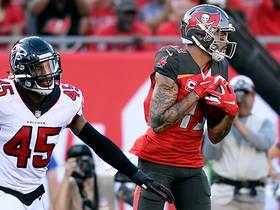 Analysis: Evans sat out Sunday's session after absorbing a blow to the back in Friday's exhibition game against the Lions, but that was evidently a minor issue and the wideout will now continue his preparations for the Bucs' regular-season opener. Evans (undisclosed) was an observer at Sunday's practice, Greg Auman of The Athletic Tampa Bay reports. Analysis: Auman notes that Evans took "a pretty good shot to the back" while making a play in Friday's preseason game against the Lions. That said, the star wideout's issue "doesn't appear to be anything significant," per Auman. The Buccaneers may simply be taking it easy with Evans, who presumably wouldn't play in Thursday's preseason finale even if he were 100 percent healthy. Evans finished without a target on 16 snaps in Friday's preseason loss to the Lions. Analysis: Evans was flagged for pass interference at the end of the first quarter on what would've been a 21-yard gain. It was a quiet night otherwise, leaving him with a preseason stat line of four catches for 75 yards on six targets in three games. Evans likely will be held out in the final week of the preseason to ensure he stays healthy for a Week 1 road game against a Saints team that held him to six catches for 68 yards (on 19 targets) in two matchups last year. Evans secured both of his targets for 26 yards in the Buccaneers' 26-24 preseason win over the Dolphins on Thursday. Evans hauled in a long scoring pass down the left sideline during Thursday's "mock game" and also made a picturesque grab during a two-minute drill, Scott Smith of the team's official site reports. Evans made an impressive catch down the middle on a play-action throw from Jameis Winston in Sunday's practice, Carmen Vitali of the team's official site reports. Evans is slated to catch passes from backup quarterback Ryan Fitzpatrick for the first three games of the 2018 regular season in the wake of Jameis Winston's expected suspension for violating the NFL's personal conduct policy, Jenna Laine of ESPN.com reports. Evans and the Buccaneers have agreed to a five-year, $82.5 million extension that includes $55 million guaranteed, Adam Schefter of ESPN reports. Evans brought in five of 13 targets for 55 yards in Sunday's 31-24 win over the Saints. He also caught a two-point conversion pass. Evans brought in six of eight targets for 107 yards in Sunday's 22-19 loss to the Panthers. Evans caught five of eight targets for 79 yards and a touchdown in Monday night's 24-21 loss to the Falcons. Evans secured two of five targets for 25 yards in Sunday's 24-21 loss to the Lions. Evans brought in two of six targets for 33 yards in Sunday's 26-20 overtime loss to the Packers. 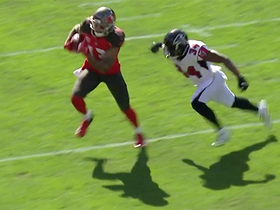 Analysis: Evans drew even with Cameron Brate for the team lead in targets on a day where the returning Jameis Winston (shoulder) spread the ball around to 10 different pass catchers. The former Pro Bowler had seen a combined 22 targets from Ryan Fitzpatrick over the prior pair of contests and at least eight looks in each of Winston's full games prior to Week 13, so Sunday's modest volume is more of an outlier than anything else. He'll look to get his production back on track against the Lions in Week 14. Evans brought in six of 12 targets for 78 yards in Sunday's 34-20 loss to the Falcons. 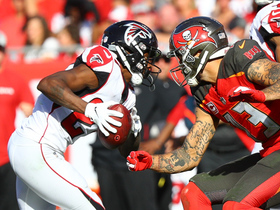 Analysis: Evans once again paced the Buccaneers in receiving yardage and targets while checking in second behind DeSean Jackson in receptions. 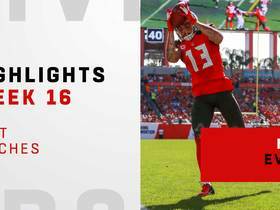 The fourth-year wideout has logged between five and seven catches in four of the last five contests, although his first 100-yard effort of the season continues to elude him. Evans has also failed to reach the end zone in the last four games, a matter he'll try to remedy versus the Packers in Week 13. Evans brought in five of 10 targets for 92 yards in Sunday's 30-20 win over the Dolphins. 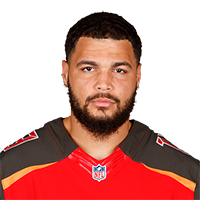 Evans has served his one-game suspension and will return for Sunday's game at Miami, Scott Smith of the Buccaneers' official site reports. Analysis: The brief ban derived from Evans' hit on the Saints' Marshon Lattimore in Week 9. In Evans' place, Chris Godwin got the start and turned 10 targets into five receptions for 68 yards. Expect such volume to be swallowed up by Evans upon his imminent return. Evans' one-game suspension has been upheld upon appeal, NFL VP of Football Communications Michael Signora reports. Analysis: Evans challenged the one-game suspension he was levied for a blindside hit in last week's loss to the Saints, but appeals officer James Thrash saw no reason to overturn the ban, so Evans will be forced to sit out this week's matchup with the Jets. With Evans out, DeSean Jackson and Adam Humphries are the favorites to lead Buccaneers wide receivers in snaps in Week 10, and Chris Godwin could be more of a factor in the passing game. Evans will appeal the one-game suspension he received Monday, Ian Rapoport of NFL Network reports. Evans was suspended one game for his conduct during Sunday's 30-10 loss in New Orleans. Analysis: Evans received the suspension without pay "for violations of unsportsmanlike conduct and unnecessary roughness rules." Specifically, he blindsided rookie cornerback Marshon Lattimore in the back during the third quarter, knocking him to the turf. The suspension will go into effect this Sunday versus the Jets, meaning Evans' next chance to suit up is Sunday, Nov. 19 in Miami, though Evans can appeal. Evans brought in one of six targets for 13 yards in Sunday's 30-10 loss to the Saints.